In 2013, Nazia, a Rehbar-e-Taleem (RET) teacher, married Zubair, 32, a banker. Everything was going smooth till Zubair wanted to have a child. But to his surprise Nazia refused. Reason: Nazia was still a contractual employee, she could not avail a maternity leave. This irked Nazia’s in-laws to the extent that the matter forced the couple to live separately. Zubair’s father, Abdul Majid Dar, 61, now sits quietly in his grand house, watching television with his wife Mehmooda, 55. Dar and Mehmooda’s dream of a grandchild was shattered, thanks to Nazia’s employment status. Zubair is the only child of his parents. Zubair had married Nazia after five years of courtship. Nazia wanted to defer motherhood till she gets entitled to have maternity leave for a longer period. But the wait was not acceptable to her in-laws, something that led to arguments and counter-arguments. Fed up with continuous fights, one morning Nazia left for school and didn’t return. She went to her parent’s house instead. “Even if I go back now, it won’t be like earlier. Damage is already done,” says Nazia. Nazia’s is not an isolated case, there are many more like her whose families have been shattered, courtesy: denial of leave during the contractual period. However, breather came recently when J&K High Court stayed a government notification that deprived female employees of ‘honorarium’ against maternity leave. In one calendar year, an RET is entitled to 15 days of casual leave and one month leave in case of medical emergency, including pregnancy. The period of contract for RET’s is five years. Any contractual appointment can avail casual leaves with intermittent breaks. In case he/she exhausts all leaves, then any leave taken afterwards is treated with an option of without pay. At the end of contract, an employee is required to submit his/her report card mentioning their work, conduct, and leave statements. Any adverse comment can prolong their contract or affect their promotions. Sana’s parents are looking for a match for her since last three years. A banker, Sana’s office timings are a major hurdle in her matchmaking. “Few months back, it was almost done,” said Sana. After families agreed, the guy, a veterinary assistant surgeon, came to see Sana at her office. The long line of customers surrounding her work desk didn’t let him interact with Sana. So he waited outside the bank for Sana to come out. “I came out at 6 pm. He straightaway said bank job is difficult with odd timings,” recalls Sana. Since then Sana didn’t hear from him again. The problem is not limited to female employees only; their male counterparts too face such issues. With all government employments in recent years given on contract bases, private sector has emerged as major employer. But given the difficulty in availing leaves in case of marriage or an emergency, it has left employers in a dilemma. For government servants, whom a competent punishing authority has decided to dismiss, remove or prematurely retire from government service, ‘leave shall not be granted’ to him. A government employee, serving in a department other than Vacation Department, those departments which have provision of vacations like Judicial, Forest, Medical, Police, Revenue, Education, Agriculture, Industries, is entitled to 30 days earned leave in a calendar year. The maximum limit for accumulation of earned leave is 300 days in entire service career. But, a government servant may be paid cash equivalent of leave salary in respect of period of earned leave at the time of retirement on superannuation. For employees serving in Vacation departments are not entitled to any earned leave, if they have availed full vacation leave that year. Every year a government employee is entitled to 20 half-pay leaves, with maximum of 180 days during entire service career. While as Commuted leave or medical leave, not exceeding half the amount of half-pay leave due may be granted on the submission of medical certificate only. Extra ordinary leave is granted in special circumstances, when no other leave is admissible or employee gives in writing for such leave. Maternity leave is granted to female government employee twice for a period of 180 days. This leave, is not debited against the leave account. Instead she gets paid leave salary equal to the pay drawn. With the introduction of ‘child care leave’, female employees can go on leave for maximum period of 730 days during her entire service, which she can avail twice, for rearing or for looking after any of their (children) needs, such as education, sickness. Child in this case means: “below the age of eighteen years; or a child below the age of twenty-two years with a minimum disability of forty percent.” During the period of child care leave, a woman employee shall be paid leave salary equal to pay drawn immediately before proceeding on leave. This leave is not granted during probation and not for more than three spells in a calendar year with maximum limit of 120 days. In addition to this, as per old rules, in case of mis-carriage including abortion, leave of six weeks is also granted to female employees. For male government employee, the paternity leave is granted for 15 days. There is ‘special casual leave’ for 6 to 14 days for males and females respectively who would undergo sterilisation operation, like vasectomy and tubectomy. While as there is maximum of 24 months, special disability leave, in case of employee who gets injured while performing his official duty. But, first 120 days are equal to leave salary (as per earned leave). And remaining days are taken equivalent to leave salary during half pay leave. An employee can avail a leave of 21 days, Quarantine leave, in case of any infectious diseases. For any sort of emergency or unplanned work, there is provision of casual leave not exceeding 15 days in a year in aggregate. As per rule, a government servant on casual leave is not treated as absent from duty and his pay is not intermitted. The exception to limit of casual leaves are Police, Home Guard, Fire Service Personnel and Warden staff of jails have to remain on duty even on holidays and days of festivities they shall be eligible to avail casual leave not exceeding 20 days in a year in aggregate. In a place like Kashmir, strikes, leaves, holidays, curfews etc. form a significant part of an employee’s career. There are 28 state holidays, 4 provincial holidays for Kashmir region and 3 for Jammu. Besides 4 restricted holidays, there are 12 local holidays of district and Tehsil level. Plus, on an average there are 48 Sundays in a year. In case of secretariat and its associate offices, there is addition of 48 Saturdays. They also get 20 days of leave while shifting from Srinagar to Jammu and back. In case of Kashmir, there are at least 20 holidays a year, on an average because of shutdown calls. The number may go up, in case of any untoward incident. 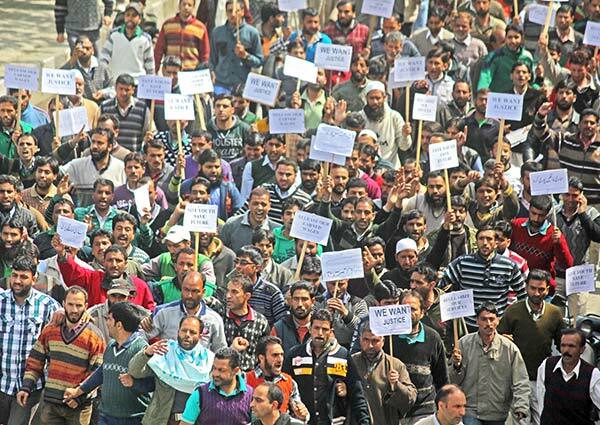 Going by the normal estimate, in Kashmir, an employee stays home for around 100 days, in Jammu it is just 70 days.